Two more points on the stress testing issue. I’ve mentioned a couple of times that someone who was at the Finance and Expenditure Committee hearing on the day of the Financial Stability Report had told me that the Governor deliberately refused to answer a question about the stress tests, and the implications of those results for assessments of the stability of New Zealand’s financial system. Bishop Thanks, Governor. I’m just interested in teasing out what the specific risks to financial stability are for Auckland house prices, because the banking sector has rising capital and liquidity buffers; they exceed the minimums. The banks came through the stress testing pretty well last year. Credit growth is relatively restrained, and as a percentage of GDP, credit is below where it was in 2008-09. So given all that, what are the specific risks to financial stability—which is what we’re discussing here today—from the rising Auckland prices? Wheeler I think they’re very substantial. I mean, if you look at mortgage commitments, you quoted a number that credit flowing to the housing sector was low. It is on a net basis, but if you look at mortgage commitments, they’re growing at around 20 percent. House prices in Auckland are growing at around 17 percent. They’ve been growing in the rest of the country over the last year at around 2 percent. If you look at house prices to disposable income in Auckland, that ratio is 7.4 percent. But the rest of the country is 4.2 percent. If you look at rental yields in Auckland, they’re at historic lows, which suggests that there’s a lot of people basically investing for capital gain, whereas the rental yields across the country are basically where they have been for the last 10 years. If you look at the median house price in Auckland, it’s up 60 percent since 2008. We had the highest rate of house price inflation in the OECD from 2003 to 2008. So the median house price in Auckland is now 60 percent above that. If you look at the Demographia survey that was done last year, we were 14th out of 370 housing markets around the world, in terms of affordability. If you look at the survey that was done by ANZ Bank in terms of investor expectations, late last year, basically, investors in Auckland were forecasting that house prices would increase by 75 percent over the next 5 years. Now, our job is to try and keep inflation, on average, at around 2 percent per annum. So that’s just a phenomenal increase in house prices that are anticipated, and that would just drive house price to disposal income ratios up at a huge rate. So there’s a whole range of reasons why there are major, I think, financial stability risks around Auckland. The Governor raised a number of interesting issues, and possible areas of risk, but did not respond to any of Bishop’s points or questions. Now sometimes MPs at select committees can ask questions just to be on record as having asked them, or to make partisan points. And so there is an art in how public servants respond to such questions. But Bishop’s questions and points don’t look as though they fit either of those categories. They seem to be entirely reasonable questions, drawing on the Bank’s own factual material, and yet the Governor simply chose not to engage or respond. That doesn’t seem very wise, or very accountable. And now, back to some geeky stuff. In discussing the stress tests this morning I mentioned the issue of what size house price fall one might reasonably assume if the stress tests were re-run today. But as someone pointed out, neither I nor the Bank touched on the other factor that is critical in assessing the likelihood of large loan losses, and that is what happens to unemployment. By and large, falls in house prices alone do not result in large losses for banks. Between with-recourse lending and a general desire to avoid moving (which is costly and disruptive), owner-occupiers don’t tend to default if they can service their debts. Banks can, typically, foreclose if the borrower has negative equity, but are unlikely to do so if the debt is being serviced. Much the same is likely to go for lending for investment properties – if rents are high enough to cover the debt service, banks aren’t likely to foreclose. Foreclosing (itself expensive) crystallises a loss, which might otherwise never happen. Similarly, high unemployment alone doesn’t typically lead to large loan losses on residential lending. Some individuals will end up losing their houses, but if they have to sell up (or be sold up) the sale price will usually cover most or all of the debt outstanding. What gets really nasty is the scenario in which house prices fall a long way and unemployment goes up a lot (and stays high for a while). In that scenario, many people can’t service their debts (even if the OCR is cut) and if they have to sell, in many cases the proceeds won’t be large enough to cover the debts. That is the scenario the Reserve Bank’s stress tests (rightly) focused on. It is the true test of the quality of the residential mortgage loan book. The Reserve Bank tells us that in the stress test they assumed that the unemployment rate “peaks at just over 13 per cent”. The unemployment rate at present is 5.8 per cent, and the “natural rate” is probably around 5 per cent. The modern low was 3.4 per cent. So 13 per cent is a long way away. In normal times it would take around an 8 percentage point increase in the unemployment rate to get to “just over 13 per cent”. I was curious how unusual 13 per cent unemployment rates were, so I downloaded the OECD data as far back as it goes. In most cases, that is just over 30 years (but we also know that in most OECD countries the earlier decades were decades of pretty full employment). 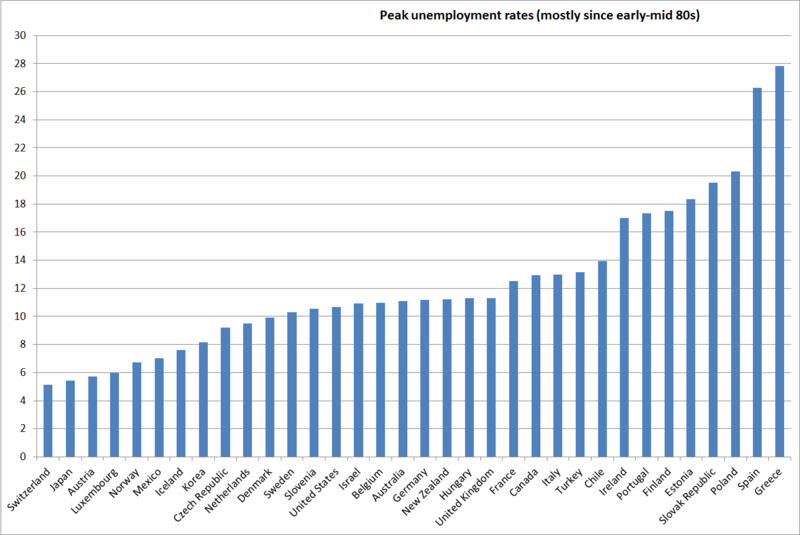 Here is the chart of the highest unemployment rates on record for each of the 34 OECD countries. Only 13 of the 34 countries has had an unemployment of 12.5 per cent or above in more than 30 years. I took a look at those countries. First, I wanted to understand how much the unemployment rate had increased by in each of those country episodes. If the NAIRU in one country had been 10 per cent (perhaps reflecting very restrictive labour market regulation), an increase in the unemployment rate to 13 per cent would have much different implications than if that country’s NAIRU was 6 per cent. Of the 13 countries whose unemployment rates had peaked at over 12.5 per cent, in one case that peak was the first observation in the database (so I couldn’t tell where the unemployment rate had risen from). Six of the other 12 had had increases in their unemployment rates of 8 percentage points or more (from the previous cyclical low to the measured all-time peak). Thus, for example, Greece’s unemployment rate peaked at 27.8 per cent last year, but had been as low as 7.5 per cent in 2008. But the other factor I looked at was the exchange rate regime these countries had been using when their unemployment rate rose to 13 per cent or more. In only two of the 13 cases had the exchange rate been floating, and in neither of those cases had the unemployment rates increased by anything like 8 percentage points. Why do floating exchange rates matter? Simply because they act as a buffer when the economy is hit by severe shocks. Greece, Spain, and Ireland have had very high unemployment rates (and large increases in those rates) in the last few years because they have had no independent national monetary policy, and no ability for their national nominal exchange rates to depreciate. The US, the UK, and Iceland, on the other hand, each having had a nasty financial crisis, had nothing like the extent of those increases in unemployment. Adjustment is a great deal harder, and more costly, without the additional flexibility the floating exchange rate provides. But New Zealand has had a floating exchange rate for 30 years now, and when the economy has been in serious difficulties the exchange rate has fallen a long way. No one really doubts that the same would happen again if, say, there was a serious recession here that involved the OCR being cut to, or near, zero. And the transitional costs of both lowering inflation markedly, and closing the fiscal deficit, at the same time. And so, again, we are left wondering where is the evidence for the Governor’s latest regulatory initiative? If the unemployment rate did top 13%, it would almost certainly have to be the RBNZ’s fault. So perhaps they are taking out an insurance policy against their own future stupidity.